Merger mania that swept the industrial automation industry in the 1980s and 1990s made some of the largest product suppliers even larger—and eliminated others. A similar trend has begun among suppliers of contract engineering services. More integrators are departing from the tradition of being relatively small, independent companies, offering specialized services to a few targeted industries or a limited geographic area. Several have joined forces to create larger, more diversified engineering firms. Others have found new homes as divisions of automation suppliers, providing engineering services to complement the suppliers' product sales. That's how Walsh Automation became part of the Wonderware Strategic Integration Group for Invensys and how five of the largest U.S. regional integrators (Team Controls, Magnum Technologies, Continental Controls, Enter-Tech Automated Control Systems, and Instrument Control Service) became part of GE Energy. Similarly, Emerson Process Management acquired four system integrators of its own (Orion CEM, Westinghouse Process Control, Kenonic Controls, and PC&E) plus the system integration division of Fisher-Rosemount and renamed them "industry centers." Though all share the corporate resources of their parent company, each specializes in specific applications—pulp and paper; power, water, and wastewater; hydrocarbons and energy; chemicals, food, and beverage; and pharmaceuticals and refining, respectively. And it's not just a buying binge from these and other major suppliers. Manufacturing equipment vendor Meikle Automation purchased system integrator Alliance Automation to expand its operations and support throughout North America. Automation Systems & Control, the system integration division of the Esco Group, acquired two independent integrators (Industrial Controls Engineering and Automation Solutions Inc.) to secure new clients and add additional engineering resources. Synergy also motivated M.C. Dean, an electrical design/build firm, to acquire system integrator CIM Associates. "As one entity, there is a higher level of interaction between the groups in developing potential business opportunities," says Robert Link, general manager of CIM Associates. "Furthermore, we have already had other groups under Dean's umbrella identify opportunities for CIM that would never have been available to us as a stand-alone, small-integration group." Even some system integrators have felt the need to make their own acquisitions. Optimation Technology bought fellow integrators Klug Systems and Omnia Technology, plus a minority position in Quantum Automation Systems. Bill Pollock, Optimation's president, says more acquisitions are in the works. "Some of our traditional clients have radically reduced operations in the U.S. Without acquisitions to add new clients and opportunities, we would be a smaller company. The only way we see clear growth is through acquisition. So far all is successful, hence the continuation of the plan." Integrators listed in the Control Engineering Automation Integrator Guide claim these revenue ranges. Counts include suppliers with system integraiton divisions. Source: Control Engineering. Growth is a common theme driving merger mania, especially for suppliers. Though price wars and technical parity have reduced many automation products to commodity status, lower margins can be supplemented by selling a package—products and the engineering services required to integrate them into a client's automated facility. Furthermore, "The rapid pace of technical innovation in the industrial automation arena has required manufacturers [clients] to depend more heavily on suppliers, such as Omron, for engineering and support expertise," says Joe Malucci, general manager of Omron IDM Controls. Omron Electronics acquired IDM Controls to meet this growing need as well as to gain access to IDM Controls' broad product offering. Walter's Precision Service Inc., a supplier of close tolerance gages and machine fixtures, formed a strategic alliance with Gladstone Automation LLC, for similar reasons. Gladstone's president, Jim Machnicki, reports that his company offered "engineering presence" that Walter's lacked. Conversely, Gladstone lacked manufacturing capabilities. Together, the allied companies can offer turnkey solutions for custom factory automation. Gladstone provides engineering, design, assembly, debug, and maintenance, while Walter's provides all of the machining, fabrication, and in-process capabilities. "One could not succeed without the other," says Machinki. And it's not just suppliers and integrators that benefit from such mergers, acquisitions, and strategic alliances. Bigger companies can offer customers more options. Optimation's Pollock notes that "client may gain from having a branch office nearer, or they may gain from being able to get more services from a single supplier (process engineering or test systems in addition to the controls they got before). They may also gain from the size and be able to have us do more plants." Mike Miller, operations manager for Automation Systems & Control agrees. "In some cases the clients viewed [our ac-quisitions] as a positive since the smaller firms weren't always able to handle the workload." But Gladstone's Machnicki adds that there's more to it than sheer size. "Our clients receive a solution which is better, not just because it is bigger, but because of the dependency between the two companies. A well-engineered product may fail due to poor fabrication, and a product fabricated to poorly engineered instructions will usually fail." CIM's Link says his clients enjoy similar benefits. "Being able to offer a client a turnkey electrical and automation package is very attractive. Even with successful, long-term subcontractor relationships, there is always the opportunity to point fingers if things do not go perfectly. With our new set-up, this goes away." Still, consolidation in the system integration business isn't always 100% successful. Tony Zamberlan, a principal with Laramore, Douglass and Popham Consulting Engineers points to the tradeoffs involved. "I am not sure that consolidation brings much in the automation world. You can't really brute force many applications. Unless you have a very large application that can be segmented into smaller projects, you may not see the benefit of dealing with a large automation company. At some point, you cannot add programmers to a job and get an equivalent return on productivity. "Additionally, if you don't control your overhead with these consolidations, you can price yourself right out of the market. However, those companies that can bring in complementary services might have the leg up. For instance, an automation company that has an installation group and a technician group has a significant advantage not only for design build jobs but also with day-to-day service work as well. Sometimes when projects are slow, a constant flow of service work can keep a company healthy. "On the flip side, a large automation company is generally more financially stable and can bond or financially back its projects," Zamberlan adds. "Smaller firms may have problems doing that." AutomationSolutions International (ASI, separate from Esco's Automation Solutions), went through a period of consolidation and collapse, and still has a happy ending. Originally, ASI was a roll-up of 11 companies; each been profitable on its own—independent high-tech distributors and integrators plus one manufacturer. Spread across the USA, they were intended to establish a truly national presence. The goal of the consolidation was to take the new company public, but shortly after the merger, two markets ASI relied upon for a sizable portion of its business (Asia and semiconductors) hit down cycles. Undaunted, the company continued with plans for an IPO. Says co-founder Rich Manders, "ASI had all the right stuff—people, product lines, and customers." But expenses exceeded revenue and debt grew to more than $8 million, Manders says, so eventually "they filed for bankruptcy and liquidated the company." In the end, Manders ended up buying ASI's name, some of its intellectual property, and other company assets. He continues to operate a much smaller version of the company today. When asked for a moral to the story, Manders offers: "A national, high-tech organization is still viable and desirable, but," he suggests, there's a need to keep sight of market realities and business fundamentals. "Today, a national system integrator is an interesting idea, but may not be workable. Being local is a big thing. A national system integrator would have to have a local presence in every market." For more information on the organizations mentioned in this article, visit the following Web sites listed below; for complete profiles on the 1000+ system integrators listed in Control Engineering's Automation Integrator Guide, visit www.controleng.com/integrators. Traditional mergers and acquisitions aren't the only ways for system integrators to join forces. The Automation Alliance Group (http://www.automationalliance.net/, not to be confused with Meikle's Alliance Automation or the now defunct Automation Alliance Inc.) is a federation of 10 independent system integrators that share common resources and methodologies, and retain their individual identities and local presence. In addition to their broad geographic coverage, the Automation Alliance Group offers clients a combination of the 10 members' individual knowledge bases. "This gives us the ability to furnish system integration services that are best-in-class, because we have the largest knowledge and experience base in the world," says Nels Tyring, director of marketing. "We have the same kind of leverage for pricing and capabilities that the 'big company' integration divisions have," adds manager Jim Cummings, "but we aren't pushing a particular software system, or specific hardware products because a parent company owns them. We can give our clients best-of-breed projects with the exact combination of software and hardware they need, not just what we have to sell." The Automation Alliance's 10 member companies had combined revenues of $105 million, with purchases of $42 million in hardware and software products, according to 2002 figures. 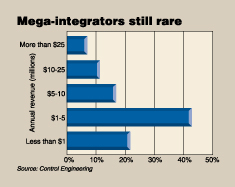 Most independent system integrators earn less than $5 million annually (see "Mega-Integrators Still Rare" chart). 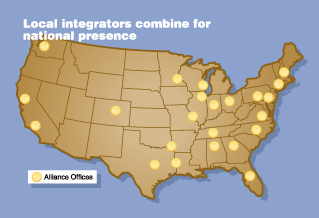 The Automation Alliance Group's 23 domestic offices are located within 300 miles of 85% of all U.S. industry. Three international offices serve the European Union, Southeast Asia, and the Caribbean as well. Source: Control Engineering with date from the Automation Alliance Group. Some consolidations fizzle or fail altogether. Steeplechase Software, a supplier of PC-based control software, acquired system integrator Ann Arbor Automation before Steeplechase was, in turn, acquired by Schneider Electric. According to Mike Klein who was then CEO of Steeplechase, the point of the Ann Arbor acquisition was to "increase our ability to provide customers with tools and methodologies that will help them build the most productive and profitable automation systems." After Steeplechase was acquired, the Ann Arbor engineers were moved into a Schneider Electric office, which was subsequently closed. Schneider Electric, now out of the system integration business, prefers to leave system design and integration to other engineering firms such as its network of authorized system integrators at http://www.squared-si.com/. "We didn't want to compete with our customers," says Edwin Newell, system integrator manager for Schneider Electric. "Our authorized integrators get the benefits of working with Schneider Electric while preserving the expertise and autonomy that good integrators are prized for in the first place." Outside the world of corporate consolidations, mergers between system integrator firms sometimes don't work out. One unsuccessful merger of system integrators was the creation of TAVA Technologies. Topro System Integration acquired four other integrators (All-Control Systems, Vision Engineering, Advanced Control Technology, and MDCS) to create TAVA, using stock swaps. TAVA's management then proceeded to turn its attention to Y2K-remediation projects. Success in that endeavor lead to a buyout by Belgian software developer Real Software, but by 2001 its U.S. subsidiary Real Enterprise Solutions (RES) had gone bankrupt. Peter Parr, who was one of Topro's sales managers at the time, explains the demise of TAVA and RES: "When Y2K went away, so did the company."